Yay! Just what I needed on this dreary, very long February day (which is only the first day of the week but which feels like it should be Friday....): a photo of yummy treats, tantalizingly posed and shot. Very cheery! Thanks! i've been meaning to make a "sleeve" for our tall glasses forever...they are way too hot when i use them for tea. never thought to use a wrist warmer! then again...i'm too scared to make anything more difficult than a 2x2 rib when knitting in the round. yours is so much prettier!! oh my goodness! are those hearts? warming your tea? tania, please concentrate really hard and let's make spring come already...arg! 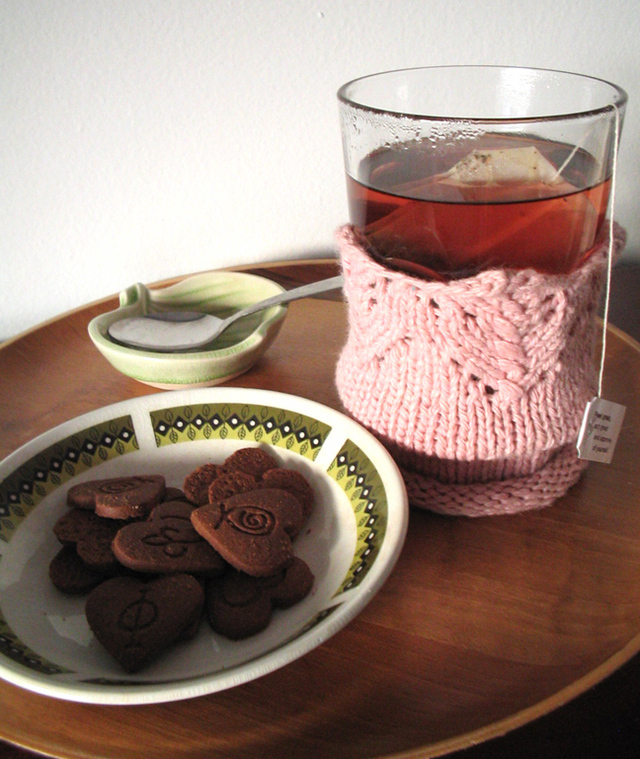 I love the "tea warmer" and I had a sudden craving for tea and heart shaped cookies.